Such was my reaction when trying to hunt down a simple and satisfying recipe for crepes one weekend morning. Logic may dictate that the more intelligent thing to do would have been to look for an appropriate recipe the evening before (when resting crepe batter in the fridge coincides with resting yourself in bed), but, and I am sure I am not alone when I say this, I didn’t know I wanted crepes for breakfast when I went to bed. Since, however, I certainly knew I wanted crepes for breakfast right then, I quickly hit our cookbook shelves and started the process of rapidly finding and rejecting recipes. Alice Waters wanted me to add beer to my batter and let it rest overnight. Deborah Madison wanted the batter to rest for at least two hours. Another recipe chided the reader to never—EVER—make a crepe with regular flour, because only buckwheat flour would produce a worthy and authentic crepe. All of the recipes implored the potential crepe-maker to cook their crepes in a special crepe pan or, at the very least, in a nonstick skillet, neither of which I happen to own. That’s right. No nonstick cookware. I won’t bore you with the reasons why, but about three or four years ago we retired our last nonstick pan and it’s a decision we’ve never regretted. We have two cast iron skillets (one of which is enameled) and one stainless steel-clad sauté pan and we have yet to find the need for anything else. But moving on. Eventually, my crepe saving grace was found in the pages of Joy of Cooking. Another admission: I have two copies of Joy of Cooking, one from 1985 and one from 1999. Why, you ask? Well, because between the years 1985 and 1999, ideas in cooking underwent a huge change, as they are wont to do in any given 14 year period. The two version of what are seemingly the same cookbook are fantastically different, and there are recipes in both copies that are unique to those particular editions. Not surprisingly, the crepe recipe in the 1985 version was decidedly less fussy than the one in the 1999 version so, in the end, that’s where I found the winner. Which is not to say I didn’t still feel the need to do a bit of tweaking. The recipe you see below is a super simplified version of the one I eventually decided to use as inspiration. 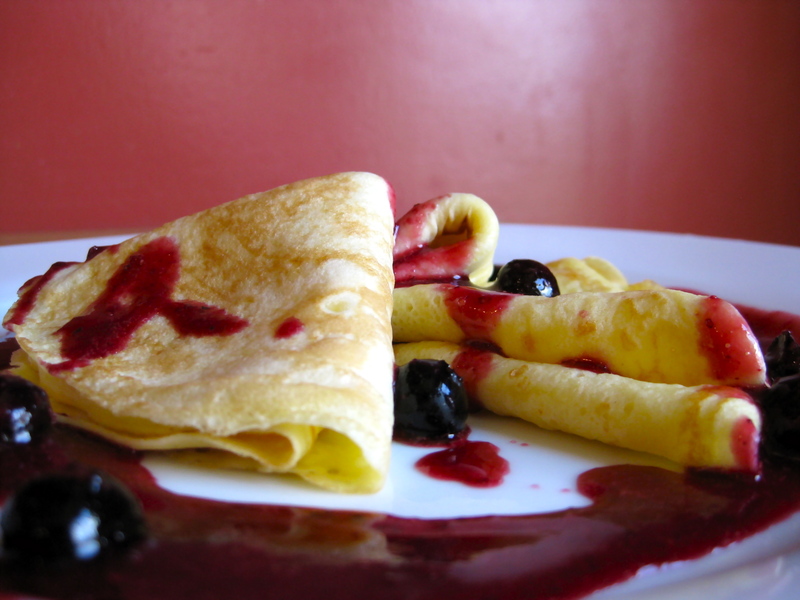 It produces crepes that are light, delicious, and infinitely adaptable. We ate the crepes with a simple sauce made from a mix of frozen berries unearthed from our freezer, but I would imagine there is no bad way to dress these fellows up—lemon curd, lightly sweetened mascarpone cheese, unadulterated fresh berries, cinnamon sugar, the list of possibilities is nearly endless. All that time you won’t spend waiting for your crepe batter to rest, you can instead spend thinking up any number of wonderful ways to fill and dress your next special breakfast, which might perhaps happen to fall this Sunday for a certain lady in your life who goes by the name Mom. Place flour in the bowl of a food processor and pulse half a dozen time to aerate the flour. Add salt, baking powder, and powdered sugar to the food processor and pulse half a dozen more times to combine. 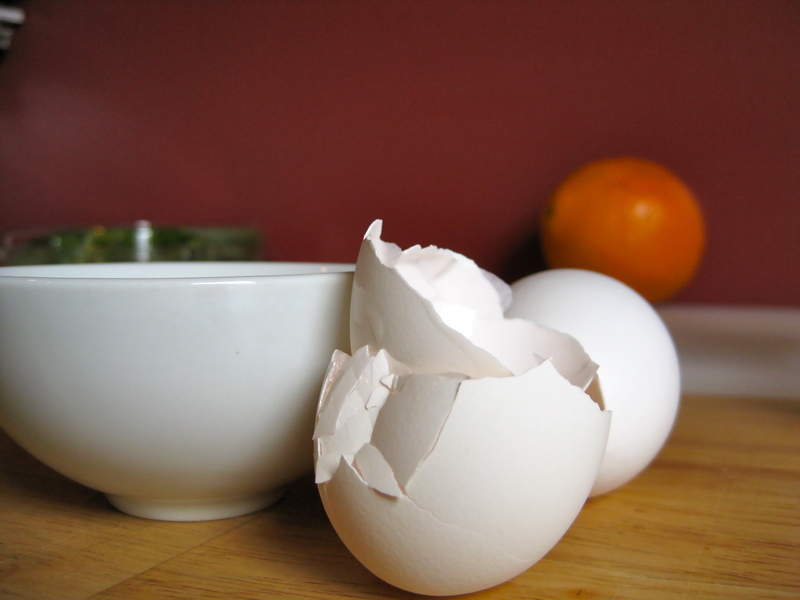 In a medium bowl, add beaten eggs, milk, water, and lemon zest, and mix to combine. 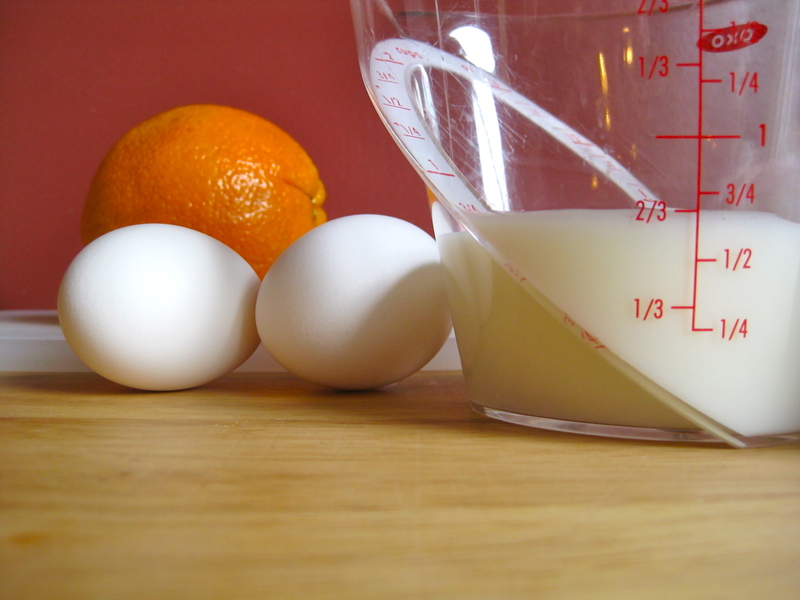 With the food processor running, slowly pour the milk and egg mixture into the flour mixture. Allow the mixture to process until combined, about 5 to 10 seconds total. If you spot a few lumps, don’t worry. Don’t try to keep processing the batter in order to eliminate all lumps–that will just make the batter tough. Thoroughly heat a small or medium skillet over medium-low heat. Lightly brush the pan with a small amount of vegetable oil. Add a small amount of batter (about 3 tablespoons), pouring it directly from the bowl of the food processor. Tip the skillet and let the batter spread over the bottom, or use a spoon to very gently coax the batter out into a wide circle. 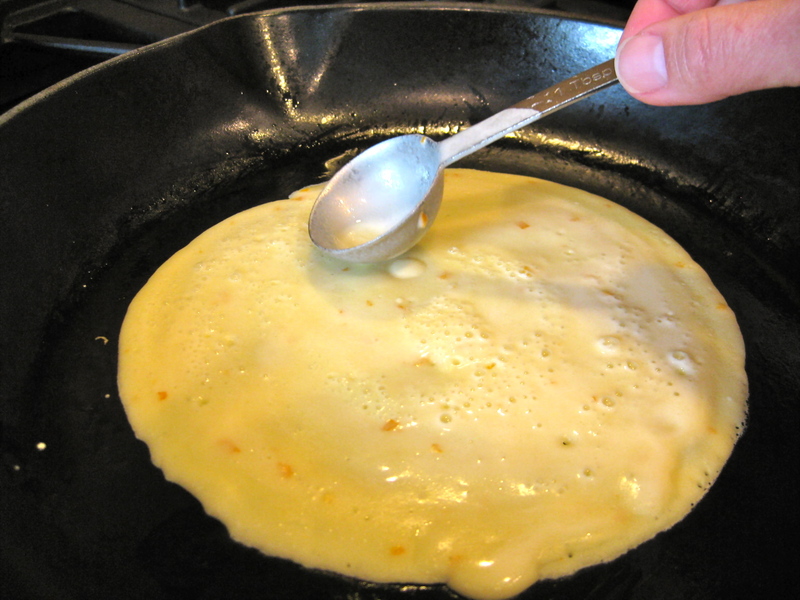 Cook the crepe until tiny bubbles begin to form and pop on the surface of the crepe. 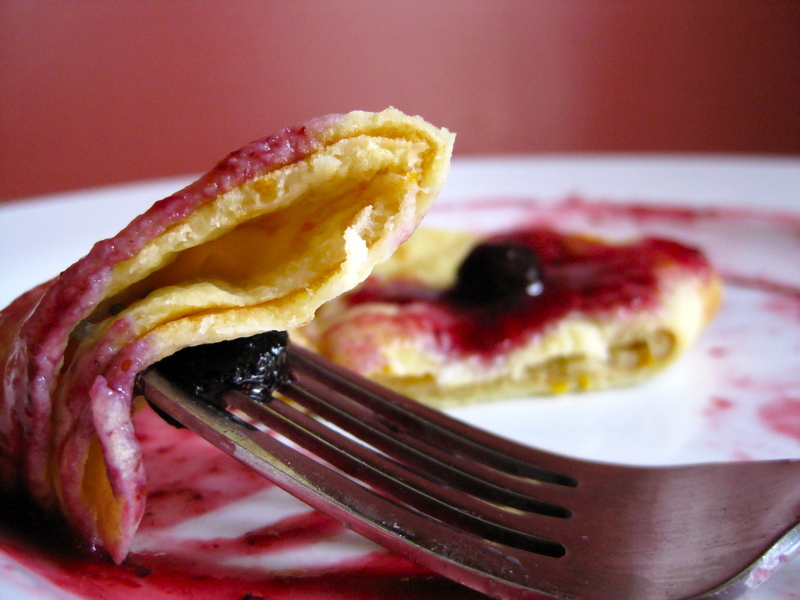 Flip crepe and cook until underside is lightly browned. 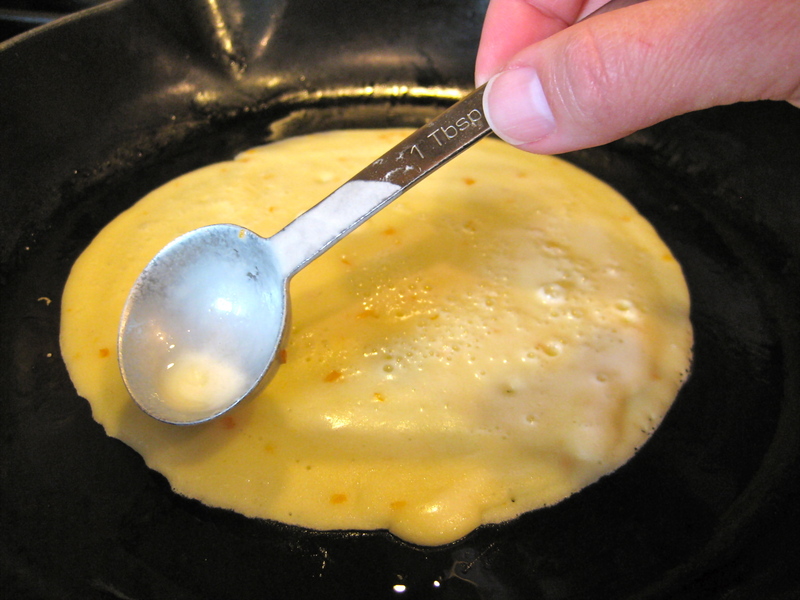 Repeat process with remaining batter, making sure to lightly brush the pan with oil before cooking each crepe. Crepes can be stacked and set aside, covered lightly with foil, while the whole batch cooks. Combine all ingredients in a saucepan and place over medium heat. Cook, stirring constantly, until the fruit just begins to fall apart, roughly five minutes. 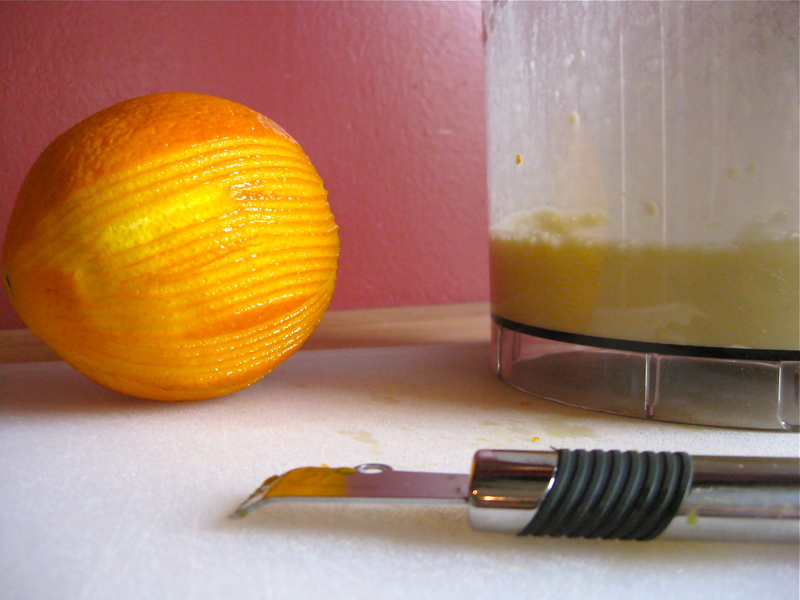 Transfer mixture to a blender or food processor and puree until about half of the mixture is blended into a liquid and the other half remains slightly chunky. If you are not a fan of textured sauce, feel free to puree the sauce until it is completely smooth, or until your desired texture has been reached. To serve crepes as shown, lightly butter each crepe (we used these orange and mint butters), then fold twice into quarters. 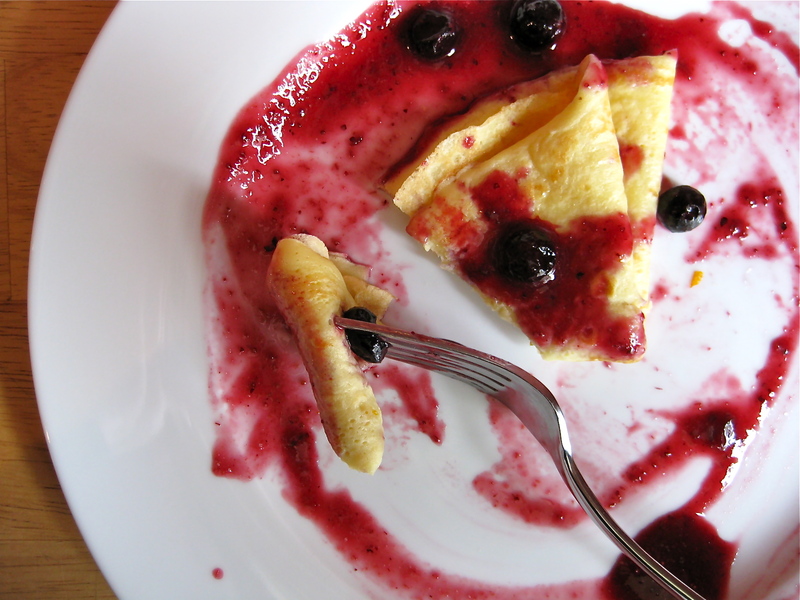 Arrange crepes on a plate and drizzle with berry sauce.